Collect, organize and evaluate your data with the investment community's #1 RFP and DDQ management platform. Do you respond to RFPs or questionnaires? Check out how InHub makes responding a breeze. Save both time and money by switching from managing RFPs & DDQs with email and spreadsheets, to managing them with InHub. Our guided process reduces errors and saves time while making sure your data is easily accessible, documented, and secured. With InHub you will make quicker, more accurate investment decisions. 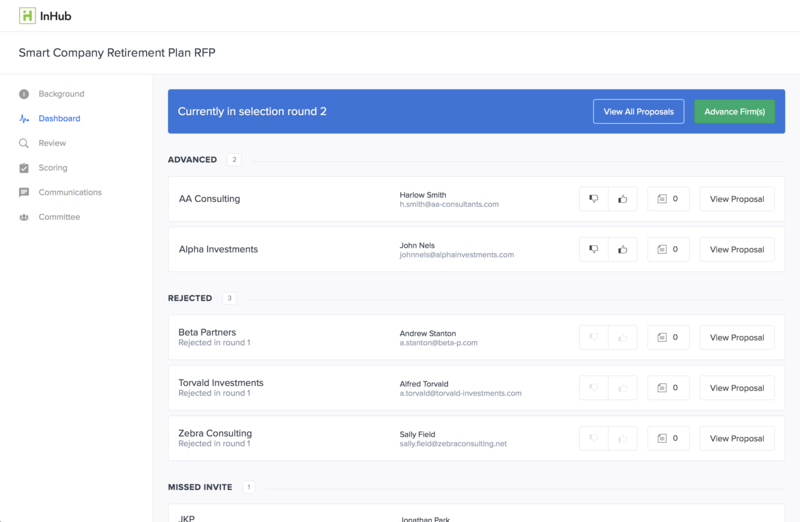 Started in 2014 as an easier way for institutional investors to conduct investment consultant RFPs, InHub is how asset allocators manage their RFP and DDQ process better. Our team is a mix of experienced investment professionals and software developers, empowering our users to make better investment decisions.